‘[For us] it is one thing to remain a good friend, but too close an embrace will lead Americans and others to resurrect the “deputy sheriff” tag. The Americans have always put their own interests first and will continue to do so; we should follow their example. American interests will not always be the same as Australian and vice versa. The bottom line, however, is the domestic political one. Australians are afraid of the outside world and convinced of their inability to cope with it. Any Australian government which suggested that we do without a great and powerful friend to look after us would have to consider the electoral implications.’ Source: Cavan Hogue — fmr. Ambassador and Dep. Permanent Representative when Australia was last on the UN Security Council. He has also served as head of mission in Mexico, Kuala Lumpur, Moscow and Bangkok, along with other posts. He is an Adjunct Professor in International Communication at Macquarie University, Sydney. The Brief: By and large, the Australian-U.S. alliance is considered by the majority of political, policy, and media elites on both sides of the Pacific Pond to be mutually beneficial, indeed essential. But behind this pact, like as with so many countries with economic, strategic and/or military ties to the empire du jour, there is a downside, one rarely acknowledged — and when it is, often rejected — in public discourse. More people though are beginning to express considerable concern. This mindset is precipitated in no small measure by the increasingly heavy-handed influence the U.S. seeks to exert globally. This is exemplified as much by its well-documented interference in the affairs of other countries and its propensity for imposing its frequently self-serving economic and strategic agenda on the international community. Along with examining why Australia might benefit from re-assessing the oft-presumed advantages of this partnership, and from there, seeking a more independent pathway, we will also reveal some of the past history of this complex, and for the U.S. in the ongoing pursuit of its hegemonic (global) ambition, sure to be a increasingly vital, geopolitical partnership. When it comes to my country Australia, to the extent that less worldly Americans might think about it, amongst the first things likely to come to mind are kangaroos, convicts, koala bears, and Crocodile Dundee. Far beyond just broadening folks’ historical awareness and cultural horizons, the following should provide a deeper appreciation of how our past history has fatefully intertwined with that of their own country. In so many cases this shared past has been to our detriment, our involvement in Korea, Vietnam for example, with Afghanistan, Iraq, Syria, and Yemen being more recent notable examples. As we’ll see such “detriment” includes one momentous and consequential CIA-inspired gambit in 1975 that culminated in the ousting of our then duly elected prime minister (PM). In short, a coup d’état, the sledge-hammer in the U.S. foreign policy toolbox, the resort to which being a recurring theme in the Washington playbook then and since. With the allegations of Russian interference in the 2016 election now a self-replicating meme, the profound irony of McCoy’s statement should not be lost on anyone! In a recent piece I also examined Uncle Sam’s decades-long penchant for coups and colour revolutions. Perhaps the least known ‘beneficiaries’ though of America’s well-documented regime renovation gambits involves Australia. As with the Iranian coup of 1953, ably backed up on this occasion by British intelligence in the form of MI6, the CIA had their not always plausibly deniable prints all over the 1975 Constitutional Crisis that triggered the dismissal – the firing in effect — by the then Governor-General Sir John Kerr, of PM Gough Whitlam and his government. Few would argue that Australia was experiencing a “serious electoral contest” at the time of this crisis, and it was one that certainly qualified as “critical” to U.S. “geopolitical interests”. In succumbing to its interventionist impulses however, whether America was justified in the covert actions it took is an entirely different matter. The track record in so many other countries would lead most to suggest it wasn’t. As Australia’s own dissident elder statesman and renowned filmmaker and investigative journalist John Pilger noted in a piece he wrote in 2014 eulogising on the death of Whitlam at age 94, Kerr was not just the “Queen’s man” in Australia; prior to being appointed as Australia’s head of state, he had “long standing ties” to both Britain’s MI6 and the CIA. Whitlam, who assumed power in 1972 after twenty-three years of conservative rule by a coalition of the Liberal and then Country (now National) parties, tellingly a ruling clique increasingly viewed by many as too subservient to Washington, believed that a foreign power shouldn’t control his country’s resources or dictate its economic, military and foreign policies. Australian Prime Minister Gough Whitlam and President Richard Nixon Enjoy a Fireside Chat, 1973. Whitlam wanted his “farm’ back; Tricky, Hank & Co. already had other ideas. To say Australia – arguably America’s most steadfast to a fault vassal state — had not experienced anything quite it before or since is an understatement of heroic proportions. And the reason why it has not happened since that time is simple: Our politicians, especially those from the nominally left side of politics, to their credit (dubious as such “credit” might be for many) learned their lesson well. They have behaved themselves for the duration, with now little sign any of Whitlam’s political heirs in the Labor Party will ever try and repeat history anytime soon. In what many Americans I suspect will view then as a not dissimilar state of play on their own turf, there is little daylight between the foreign policy positions of both our major parties. This is especially so when it comes to Australian-U.S. relations (much like one suspects that of the U.S-Israeli relationship where each party tries to top each other in its demonstrations of fealty to Tel Aviv, the key distinction being here that the roles of David and Goliath are reversed), and that of ANZUS, the formal foreign policy and military-intelligence-security alliance that underpins these relations. At this point, it’s enough to know the main catalysts for the coup. This requires an overview of some of the history and strategic nature of the U.S.-Australian relationship itself, if for no other reason than most Americans (and doubtless more than a few of my fellow Aussies) would probably not appreciate the importance to the U.S. – indeed, to the Anglo-American alliance overall – of this long-standing, albeit one-sided, marriage of convenience. As always with these things, context and perspective matters. If it indeed was a “marriage”, then it was one made less in heaven than in Washington, unless America’s capital might, in an as yet unimagined alternative universe, qualify as some idyllic empyrean equivalent thereof, a ‘meditation’ of sorts even its most deluded denizens might have difficulty undertaking. It might surprise most Americans (and again, no doubt a few Aussies as well), that one of the most vital components of the U.S. imperial communications network is located at Pine Gap in the middle of the continent. This controversial, state-of-the-art facility forms the centrepiece of our Five Eyes infrastructure, and has done going back well before Whitlam’s heyday. So important is this facility, it’s arguable that without Pine Gap, the Apollo program – including the 1969 moon landing — would not have been possible. But Pine Gap was never just about getting a man on the moon and back: Of even greater relevance for our purposes, the facility serves as the linchpin satellite reconnaissance station for spying and surveillance of friend and foe alike. Its principal task throughout the Cold War was keeping a keen eye on those decidedly untrustworthy Soviets, essentially monitoring how diligently they were adhering to arms control treaties and nuclear testing agreements. The Pine Gap facility remains still an integral component of the central nervous system of the imperial panopticon. The Pine Gap Facility, Alice Springs. Nerve Centre of the Imperial Panopticon Down Under. Once a “matter of contention”, now not so much! It’s worth noting that the highly classified intelligence that Pine Gap gathered was deciphered and later revealed publicly by Christopher Boyce, who worked for a company called TRW, at the time a CIA contractor. Boyce was troubled by the ‘deception and betrayal of an ally’ and this was apparently what motivated him to do what he did. Now this espionage narrative was later turned into a film called The Falcon and the Snowman (from a book of the same name), and amongst other revelations Boyce disclosed that the CIA had infiltrated Australia’s political and trade union elite and they actually referred to the Governor-General of Australia, Sir John Kerr, as “our man Kerr”. At this point also we require an appreciation of some additional history of our country, in particular how we morphed from being at the beck and call of the British Empire to playing a similar role vis a vis the U.S. imperium. Again the man who provides us a most illuminating insight into the events of 1975 is our own John Pilger. In seeking to break free from the confines of U.S. imperial power, Whitlam was up against as much opposition internally as he inevitably came up against externally, a not uncommon scenario in such instances where a new ruling party in an ostensible independent nation decides to take it up to Washington. And although his removal from office in such an unprecedented, unceremonious manner doubtless never figured into his trail-blazing reform calculus, in Pilger’s summation, Whitlam had few illusions about what might lie ahead of him, in either the domestic or foreign policy front. The Crimes of Patriots: Jonathan Kwitny’s Epic Tale of CIA hugger-muggery and skulduggery Down Under. Founding secretary of the AACF was a man called Richard Krygier, who also founded, and became the first editor of, Quadrant, a conservative Aussie periodical (still ‘Johnnie Walker’), also originally funded by AACF and the CIA. Put another way, the AACF was an early forerunner to the types of front organisations such as Freedom House and the infamous, democracy-defying National Endowment for Democracy (NED). These NGOs as we now know are much favored by the Langley crowd and their neo-conservative confreres the Beltway Bedlamites, their titular nomenclature in true Orwellian tradition masking a raison d’être somewhat at odds with their real mission. To underscore both the legitimacy and credibility of Menadue’s views, some understanding of his place in the political firmament and his background of achievement over six decades in both the public and private sectors is useful. From 1960 to 1967 he was private secretary to then deputy opposition leader Gough Whitlam. Menadue then moved into the private sector for seven years as General Manager of Rupert Murdoch’s News Limited, and from 1974 to 1976 was head of the Department of Prime Minister & Cabinet. Interestingly, he was “closely involved’ in the events of 1975 that led to Whitlam’s dismissal, and then served in the same position under Malcolm Fraser (of whom, more soon), the man who controversially succeeded Whitlam as PM. After a stretch as Japanese Ambassador from 1976 to 1980, Menadue returned to head the Department of Immigration & Ethnic Affairs, and later in 1983, the Department of Trade. From there he was appointed CEO of Qantas (1986-1989), became a Director of Telstra (our biggest telco; 1994-996), and was also Chairman of the Australia Japan Foundation (1991-1998). So all up, Menadue was not a man whose opinions might be dismissed easily. At 82, he’s still ‘Johnnie Walker’ and as his blog attests, remains a respected, robust voice in national and business affairs, and in public policy. Our long-time major business and trading (or economic) partner China – an alliance kick-started by Whitlam, and which has contributed enormously to our country’s stellar economic performance over the past two decades or more and which played no small part in enabling us in ways the U.S. itself wasn’t able to, [to] weather the fallout from the Global Financial Crisis (itself largely the consequence of the monumental recklessness of America’s multi-national corporate and financial behemoths, fortified by the enduring subservience and acquiescence of its political, legislative and regulatory elites), is now being challenged directly and no less recklessly and provocatively by our long-time military and security (or strategic) partner the U.S., in the words of a former Prime Minister “Our great and powerful friend”‘. Former Australian Prime Minister Malcolm Fraser — He used to be a Fan of Uncle Sam you Know? And for Fraser to come out albeit many years later to declare that Australia should seek more independence from the U.S. – the very stance upon Whitlam’s part which upset Washington so much at the time and which contributed so emphatically to his political demise – is the stuff you simply couldn’t make up! Few politicians of which I’m aware have undergone such an extraordinary Damascene conversion on so many policy levels, and left so many folks including some of our sharpest political analysts and commentators scratching their heads, many as much in bewilderment and in wonderment, with unsurprisingly, more than a few less than impressed. It has to be said then that much of this soul-searching about our relationship with Uncle Sam can be attributed to the feelings generated by America’s ill-fated and ill-judged response to the attacks of 9/11; in particular the invasion of Iraq and the consequential blowback from that disastrous decision, and from the so-called War on Terror in general that has been raging seemingly without end since 2001. 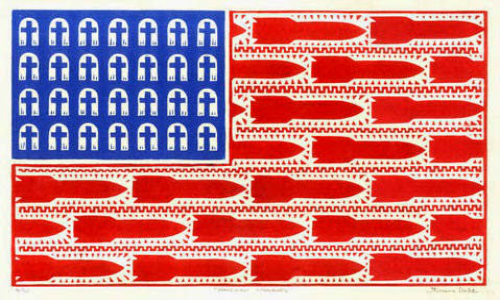 Like all countries, Australia has not been immune to the immense economic and strategic transformations that have taken place as a result of America’s relentless and ruthless campaign to achieve full spectrum dominance in all spheres of geopolitical influence – one triggered by 9/11 and on which said “campaign” continues to be justified, without any serious protest thus far from its Western partners and allies — whilst countering, even aggressively pre-empting, with every resource at its disposal any real or imagined challenge from other upstart power players. Until and unless the Bedlamites who seem to be running the Beltway circus begin to appreciate how catastrophically their actions and provocations are impacting on global peace, security, and stability, we are unlikely to see any change. All up, our continued alliance with the Empire du jour under the present arrangement is a zero-sum game for us. Those countries with similar alliances and attachments — whether in Asia or Europe — would also do well to be similarly concerned.